As tax time approaches, many of us are getting our financial documents in order for the April 15th deadline, just two months from now. We’re collecting our receipts and organizing our deductions, making sure that we have all of the necessary information to paint a complete picture for our annual returns. This got me to thinking about a scenario that many of may face in the coming months. Let’s say that a close friend of yours, one that you have trying to convince to begin prepping for several years now, has finally realized the wisdom of your advice. He’s a typical guy with a wife and two kids. He owes $100,000 on his home mortgage and $10,000 on one of his two vehicles: a 2-year old mini-van; his 5-year old small truck is finally paid off. He has a little debt on credit cards, but nothing too unmanageable. Like I said, he’s a typical guy. Your friend recognizes that he is woefully underprepared for even the most subtle of emergencies. He has a small first aid kit in the guest bathroom, a single-shot .22 calibre rifle from his youth that hasn’t been fired in 10 years, and about a week’s worth of groceries in the cabinet. Needless to say, he’s a little overwhelmed and even panicked about his lack of preparedness. After he completes this year’s Form 1040, he’ll receive $1,000 back from the federal government. He wants to spend it all on prepping supplies. He comes to you for advice. Question: What should he do or buy with the $1,000? We’d like to hear what you’d tell your friend. Please share your thoughts in the comments below and we’ll post the advice we’d give in a few days. I would tell him to start with basic essentials. Water would be my first suggestion but with two options, buy bottled water consistent with 3 gallons a day per person for his goal timeframe or spend the money on a berkey water system and be able to filter 1000 gallons per filter taking into account access to a natural water source. Next would be food. I would tell him to start putting back canned goods that his family already eats just a longer supply of it, but to also divide that with some long term storage food #10 cans would be an example. Next i would tell him that all these products are futile if he cannot protect them so my first weapon choice would be a handgun in a caliber and type he can operate and become proficient with. The berkey is around $350 to $400. The food start around $300 and the gun is a variable but obviously on this budget would be $250 with $50 in ammo. After covering these three areas i would tell him to build upon them monthly by adding to each every month as he can. Once he has a 6 month supply of food they eat on a rotating basis i would suggest adding more long term food storage and adding a better weapon to his arsenal. I would also suggest hygeine products and a first aid kit. Most important thing i would tell him is more important then all these products is his knowledge, he should read up on survival, understand different scenario’s and how to plan for them. in my opinion sheltering in place for most disaster events will be safer then moving your family somewhere else. The more knowledge he obtains the better off he will be and for the most part he can get a lot of knowledge thru books and the internet with a fair warning with the internet, common sense should always be used when researching on the internet. hope this helps, or atleast starts the conversation. $1000 is a good start, but likely not enough…. I would start with investing a chunk of that in storable food (canned and dehydrated) and also water supplies and purifcation supplies/equipment Perhaps some heritage seeds for future gardens, as well as a newer firearm or two and ammo for same. Darn…there goes that $1000….. We didn’t even touch on bug out bags, communication, heat, first aid/sterilization…etc. That being said, any prep is better than no prep! After all…if you didn’t plant that fruit tree 10 years ago, then the next best time to plant it is today! Lots of free YouTube videos and PDFs. What are you preparing for? Start small, build up from there. Food/water: Berkey water filter, a case of mainstay, and then some bulk food stores, stock up on some canned goods – get the food stores to 1 month, then 3, spread out from there. Security: many will zero-in on that .22 – may be OK, for a bit, really – get it checked out by a gunsmith, put some rounds downrange and maintain it. Having good locks on the windows and doors is a better start, IMHO. First Aid: Make a trip to the local big box store and build up a better fist aid kit – calling 911 might not have any results one day. Lighting: got a sturdy flashlight and plenty of batteries? Have a good emergency radio? Make sure the van and truck are in good mechanical shape – no room for deferred maintenance. I would tell him to put that $1,000 away for right now and get educated about preparedness first. 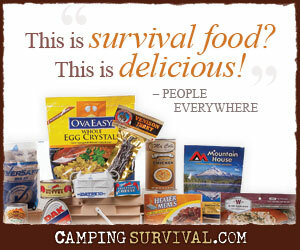 Do some reading about food storage and preparedness, like on this blog. Get educated, make a plan, talk to others who think the same way. These things are free! As for the $1,000 I would then tell him to start with his family’s basic needs, Food, Water, or any special needs, for at least three months. The best way the money can be spent is by buying a water filter as others have mentioned, garden tools, and wood cutting tools. Canned goods are all well and good, but $1000 of canned goods does not last very long. Learning to garden now and produce your own food makes the most sense. Additionally, the wood cutting tools would insure a way to cut down and collect firewood for warmth. With any money that is left, buy dried goods. Lastly, while the Internet and libraries are still available, research, research, research. Learn how to produce just about anything without a lot of fancy supplies, and always be in the mindset of looking for free stuff that you can use for supplies. a lot of good comments already, I believe that the situation would vary greatly, if his family has a farm in a rural area, it might be that he use the money to plan a bugout strategy. None the less educating himself and using the money sparing to accumulate food and used equipment. maybe contact an undertaker and offer to buyout dry goods and can goods from deceased. there are endless ways to be creative in your strategy for survival, but the key is education and hope for time to get prepared before you actually need it. Does anyone have an alergy? Benadryl and EPI pens! I would add….. if he has teenage girsl and for his wife add femine products and MOTRIN or ibuprofen to his list…….THIS WOULD BE FOR PEACE AND SANITY! could you imagine 3 women not having what they need during that time of the month. I am lucky I am the only female in a house with a husband and 2 boys. These are all great comments. I had intended on having my follow up post completed by now but I haven’t had a chance to get it finished yet. Look for it soon. That is a good question. I haven’t thought of storing in buckets in those terms actually. What I typically do is re-package my bulk food items in gallon sized Mylar bags, 3 per bucket, and then toss in a canister/box of salt, spice, or sugar. I have been using a coupon + store sale type system for years too, though I doubt I qualify for “extreme couponing” status. I try to shoot for 50% savings, though. Since most of what I can get at a grocery store is canned or boxed in something closer to “individual” servings, we have just rotated that stock on shelves in a FIFO system. Your idea of packaging a bucket for several days or a week’s worth of food is very interesting. That would be great for a bugging out type scenario or for charity. I don’t have a quick answer for your question. I will think on this some more and possibly do a post on that very thing in a week or two. Providing variety and palatability in a bucket will be a challenge. I’m thinking it will require some of those individual condiment things (like fast food restaurants have), etc. You’d be limited on meat options too. This is a great topic. I’ll try to get a better answer for you soon. Thanks! I’ve been giving this more thought and research today. I couldn’t find any postings online of people who have packaged their buckets by the week’s worth of food (or even several days) at a time. I could only find various recommendations about which things to store in 1 gal vs. 5 gal Mylar bags, using Gamma seal lids, etc. I sat down and started to list what items might work well for this project, but it’s hard to do “well.” Sure, I can put a week’s worth of oatmeal in there, but how many days in a row before people would rather pass? I can add some freeze-dried fruit, cinnamon, etc, but now I’m using up a considerable amount of space just for breakfast foods. And if I want to deviate from oatmeal, I need even more space. This may work for servings for 1 or 2 people, but probably not whole families. This got me to thinking that maybe the way to go would be by the day. I’m not sure if it’s the most space efficient way to package things, but it would be very handy. If you put a day’s worth of drinking/cooking water in with these things, the bucket would be pretty full (and heavy). Day 1 could have oatmeal with freeze-dried blueberries for breakfast, canned soups for lunch, powdered milk or other instant drink, and spaghetti sauce and noodles for dinner, with the ingredients necessary to make a week’s worth of bread. Day 2 could have powdered scrambled eggs and bacon mix, a small jar of jelly (to use on bread made the day before), tuna fish and some of those small condiment size packs of mayo and mustard to make sandwiches, and canned chicken, “cooking” soup concentrate, rice, and small spice packs to make dinner. That get’s me started anyway. Is that the kind of thing you were thinking about? If you want to only use “regular” food from the grocery store, you have the issues of the volume and weight from the liquids. If you want to use freeze-dried for at least some, it’s a bit expensive, especially when you factor in resealing them into serving sizes in Mylar. I’m going to think on it some more. Let me know if you were thinking of something else. Don’t despair, Heather… I think every new prepper feels that way. And somehow, no matter when you realize the need to get started, you always feel like you should have started years ago because time is running out. Though I didn’t know the name for what I was doing (since named “prepping”), from the moment we moved to our farm years ago, I felt a pressing need to do it ALL NOW. And since then, our unruly goats have forced us to replant most of them yet again. Your questions are good ones and they help me to look at things in a fresh way, so don’t feel badly about them. I really like the idea of having buckets ready with a few days food at a time. Unfortunately, I fear having people come here that we just can’t take in for one reason or another. I would feel much better about being able to at least provide them with some supplies to tide them over. A couple buckets with a week’s worth of food, a multi-tool and other items from “The Barter Larder,” and so on would be a blessing to them. About the mega-calorie bars- I’m not sure what to say about those. There are only a couple of circumstances that would cause us to bug-out, so that hasn’t been much of a mainstay in our preps. I think of those as more of a traveling-by-foot kind of thing where lightweight and dense calories are optimal. Each brand probably comes with its own recommendation for how many a person of a certain age would require under various circumstances. I’d check with the individual vendors’ sites. We have a few postings on using Mylar bags to store bulk food items. You may also find some other useful things under the Food Storage category. Beyond that, there are probably some YouTube videos that would be helpful, but I don’t use it much since it eats up all our bandwidth on our connection out here in the sticks. I rarely have time to sit down and read the blogs on our blogroll, but no doubt, there is some more good info on those too. Please feel free to ask anymore questions you have and I will try to answer them. That is the purpose of this blog- we feel it’s a ministry to share what we’ve already had the opportunity to learn to save others some time and mistakes. all good comments, a lot of good stuff. I always wonder about folks and their situation. I had girl working for me and her name was scarlet. I said I love the name thinking she was southern, she said I was named after my grandmother. She was from California, and I inquired more about the family. She had never met her grandmother. Her dad was a corporate creature. I felt sorry for that girl, she knew nothing about her family and had no heritage. Well that leads me to my recommendation. If you have family or friend within a reasonable drive that lives in a rural area, I would begin to spend the money on a bug out plan. You need to store up enough gas to get you there. You need to plan your route. You need bugout bags with stuff that you will take with you, and they need to be packed at all times. If your like me you don’t wanna be stuck surrounded by five million hungry pissed off city idiots…I will take my chances with country idiots any day, as for, they are ten times smarter and more self reliant. Your right, Scrambo. Life in a city after a collapse will be very difficult. A dense population combined with no way to grow or produce food will make it tough for those who aren’t prepared. Excellent thoughts, Douglas! Thanks for sharing! As an aside, dented cans are a great value for near-term consumption, but for longer term storage we’ve found that the damage can shorten the shelf-life.